يقع The Cove على حافة بحيرة تاوبو، ويوفرغرف فاخرة مع تلفزيون مع قنوات فضائية وإما مطابخ مجهزة تجهيزاً كاملاً أو مطابخ صغيرة، كما يحتوي على مكتب للجولات السياحية يوفر الحجوزات للأنشطة المحلية، بما في ذلك صيد سمك السلمون المرقط والقفز بالمظلات وركوب الدراجات في الجبال، وتتوفر مواقف مجانية للسيارات في الموقع. يقع The Cove Taupo الذي تم تجديده في عام 2014، على بعد 5 دقائق بالسيارة من نهر وايكاتو وعلى بعد 10 دقائق بالسيارة من نادي تاوبو للغولف ومن مطار تاوبو، وتبعد شلالات هوكا الشهيرة مسافة 15 دقيقة بالسيارة. تحتوي جميع الغرف على خدمة الواي فاي مجاناً وساعة منبه وحمام مع لوازم استحمام للضيف، كما تحتوي بعض الغرف على شرفة خاصة مع حوض استحمام ساخن أو إطلالات خلابة على البحيرة. يعتبر The Cove أيضاً مقر لمقهى Espresso Cove الذي يقدم وجبة إفطار وقائمة غداء يومياً وإعداد قهوة باريستا ومجموعة مختارة من الخيارات الحلوة والمالحة، ويوفر تراس المقهى إطلالات خلابة على بحيرة تاوبو. يُرجى العلم بأن الأطفال الأقل من 12 عامًا يتمتعون بإقامة مجانية. Place is really clean . Such a serene place. Pure bliss! A special ending to a holiday with my son and his partner - 2nd time we have stayed in the Penthouse and we love it. Great location, comfortable beds and the view and spa makes staying here quite a treat. Highly recommend. I stayed here before the renovations so have seen the transformation and whoever was responsible for the reno has done an outstanding job. The fittings are beautiful even in the standard rooms you will not be disappointed if you stay here - value for money +++++ the cafe downstairs is a lovely addition with lovely staff and a great breakfast. Awesome will be returning for sure!! Am happy with the facilities which include a hot tub, swimming pool, kitchenette, and the usual room amenities. Great service from the hotel staff. The owner were just excellent! Location, cleanliness, nice ambience & overall a great place to be especially strolling along the Beach is just behind the accommodation. Loved our staying! The pictures doesn't show how beautiful the rooms are. Clean, luxurious and really nice view. We used this place as a stopover on the way down to Wellington. Ideally placed to break up a long journey. The owners were really welcoming and helpful about what to do in town. Only complaint was probably the limited parking available. It was a very pleasant stay. Welcome by friendly owner Garry and cheryl. Amazed by spa jacuzi inside our room. Our kids love it so much. We can walk by the lake just behind the hotel.definetly will come back to stay here again oneday..
Had an awsum view, great spa and comfortable sleep. The Managers are great people also, not many managers actually take the time out to talk to you, these two were great. Amazing....just love the place. Will be back again real soon. Facing the Lake Taupo. Relax surrounding. Easy to find. Very good stay. Near the Taupo Lake. Like the big room with 1 king and 1 single. 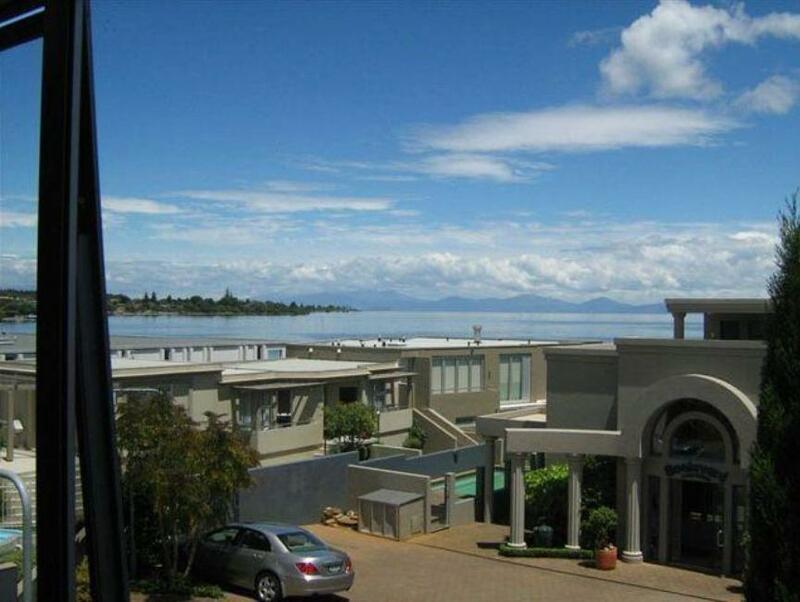 Centrally located, 3 min drive or 10 min walk to restuarants and shops. Pleasant stay.Lake Taupo is just behind the hotel. Walking distance to shops and food.